Our UPVC sliding patio doors are manufactured from the PatioMaster profile. PatioMaster UPVC doors are designed to enhance your homes style, efficiency and security. You benefit from this market leading profile when you choose our UPVC sliding patio doors. Bring the outside in with a PatioMaster patio door system. They provide classic good looks whilst providing a wide glass area, providing you with fantastic visibility. This is why our UPVC patio doors are the perfect choice for porches, balconies and conservatories. UPVC sliding patio doors allow you to enjoy the view from the comfort of your home whilst enabling quick and easy access to your garden. UPVC patio doors will make your room appear larger and brighter, creating a light and airy atmosphere. These doors are designed to allow more sunlight into your home, giving it a more open and natural appeal. 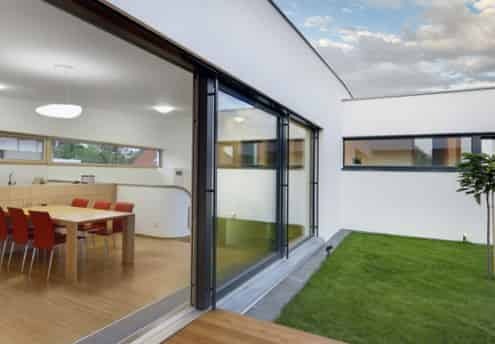 Our UPVC patio door system operates on a sliding rail which allows for a smooth and silent operation. Sliding back to the point of opening, these doors offer a large doorway making it easier to carry big items in and out of your property. UPVC sliding patio doors do not require additional space to swing open. Their sliding system means they occupy less space than hinged doors. This means the space surrounding your patio doors can be used for other things. For example, this gives you the option to place decorative objects such as vases or plants on either side of your patio doors. Our sliding patio doors are available in a variety of style options including a choice of 2, 3 and 4 leaf options. Your patio doors can either be fully glazed or designed with mid-rails and panels. Whatever your style preferences, we offer the ideal solution with a wide range of beautiful colours and finishes. The quality of PatioMaster UPVC doors means that all our UPVC products are virtually maintenance free.Our UPVC sliding patio doors will never warp, rot or require re-painting. An occasional wipe clean with warm, soapy water is all they will need. Durable, these doors will keep their smooth and sleek appearance for many years. Security is paramount and with PatioMaster UPVC sliding doors, you are guaranteed high security and protection. Made from the highest quality UPVC, our patio doors are strong and robust. Internally beaded, these doors offer maximum security. Fully welded and reinforced, they are fitted with a 4 point locking system as standard. Our ‘anti-jacking’ technology prevents your door from being lifted from the outside, preventing any attempts of a break-in.